Steve's new CD, "Inside/Out" is rooted more in his pop underpinnings than his four recent jazz offerings. A compilation of the best of his first 3 CDs! AIX Records has released "Tormé Sings Tormé," a two-disc, four-sided DVD/CD featuring a full concert performed by Steve and his dektette shot in HiDef and recorded in 5.1 channel surround sound inside the auditorium of the Colburn School of Music in Los Angeles. Among the special features are separate interviews with Steve and his dad Mel; an early duet featuring father and son; rare footage of Mel and George Shearing rehearsing together; photo galleries featuring Steve, Mel and their family; live concert footage from the first performance of "Tormé Sings Tormé" at the McCallum Theater in California; and interviews with various musicians who participated in the project. AIX Records has 1,000 Special Edition versions numbered and signed by Steve available now. 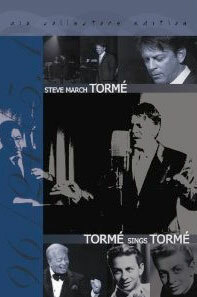 "Tormé Sings Tormé" is a "can't miss" for fans of Steve's or Mel's.